When a burger is labelled as ‘wholly inappropriate’, ‘ludicrous and irresponsible’, and ‘a heart attack on a plate’ it naturally courts attention. Family friendly restaurant chain Hungry Horse launched the Double Donut Burger in November last year and sat back as the internet launched an equally as impressive tirade against them. Yet for every angry voice is a pair of eager eyes and a rumblin’ tummy just waiting to grab a bite. We risked our health and dignity and pulled into our nearest Hungry Horse to give it a go. The Joint: There are 220 Hungry Horse restaurants spread across the UK. You can find more about them on their website. The Vibe: Clocking in at just under 2000 calories, complete with 52g of saturated fats and over 8g of salt, the Double Donut Burger doesn’t slip comfortably into your daily allowances. It’s made up of two quarter pound beef patties, four slices of crispy bacon, a stack of melted cheddar cheese, and huge dollop of BBQ sauce all sandwiched together by two sweet and sugared ring doughnuts. It’s then rounded off with a side of thick cut chips and a pot of tomato ketchup all for an agreeable £8.99 in price. It’s a monster of a dish but we’ve definitely seen bigger challenges on our plate. How does it stack up though? It’s a great mix of sweet and savoury from the first bite to the last. 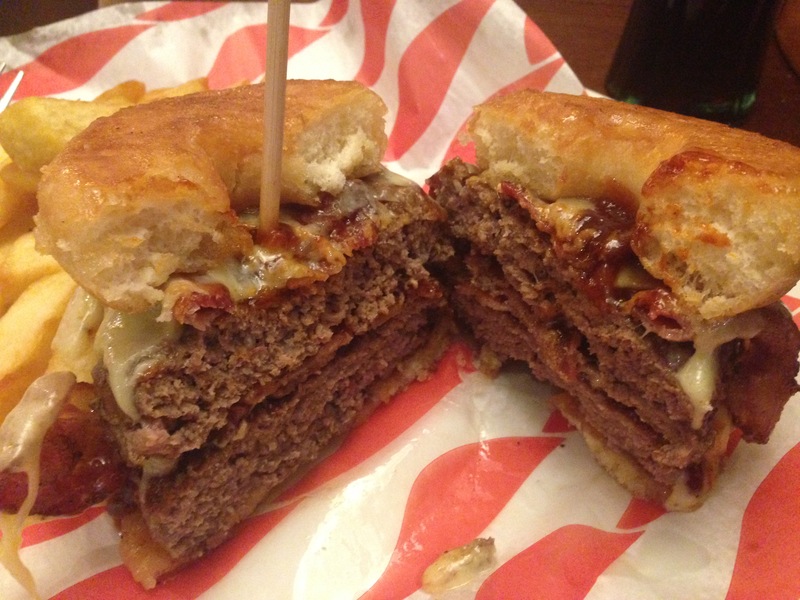 The burgers are juicy, the bacon is a nice hit, and the cheese and BBQ sauce combine to really drive the flavour. With the weight of the meat crushing the bottom doughnut it’s certainly not as visual as the menu lets you believe though, but that hidden sugar is welcome as you’re working through it. We weren’t able to pick it up with our hands though, so at times you did forget you were eating a burger. With just shy of 2,000 calories consumed in twenty minutes you’d assume that we’d be struggling towards the end, however it’s surprisingly light work. We’ve definitely all stalled at that final slice of pizza before haven’t we? This didn’t feel half a stodgy and we’re left far from bloated. 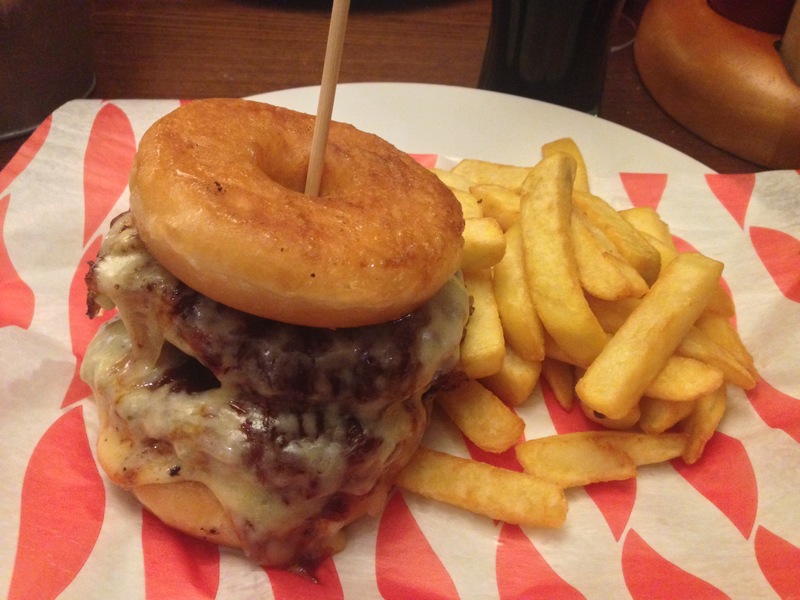 The Double Donut Burger is also, surprisingly, some 1,200 calories short of the menus most daunting item. The Wo(man) vs. Burrito racks up 3,200 with its three 12” burritos smashed full of ingredients. Whilst this has been picked up by some of the chastising journalists, it’s a gargantuan amount of food that dwarfs our humble donut burger. A brief browse through the rest of the Hungry Horse menu shows that they offer great variety and a number of healthy options too, we should add. So are Hungry Horse acting irresponsibility by serving us this meal? We don’t think so. Consumption of food requires discipline and your own level of responsibility and treating yourself to a Double Donut Burger once in a while isn’t going to be the end of days exactly. Pace yourself, add some variety throughout the week, and get exercising and you’ll be just fine. Hungry Horse was visited by Tom in January 2015. Posted in SheffieldTagged bacon, BBQ sauce, burger, calories, cheese, donut, double donut burger, doughnut, huge burger, Hungry Horse, hungryhorse, lunchBookmark the permalink.